Hey everyone! I have been really lazy about posting my cards...since I joined Instagram this summer! So here's another card I made last August, that a crafty friend said I should really put on my blog! I used some CTMH Woodgrain paper that I was obsessed with to create a frame for my card. On the front panel I stamped the sentiment from CC1147 Create Kindness-Beautiful. This was a stamp set only available a short time, which is why I hadn't shared this card. I stamped the shells from the Swirly Seashells stamp set, with gold pigment ink. Then embossed with clear embossing powder. That made it super easy to watercolor with Gansai Tambi watercolors. I loved the pearly look this gave! The picture really isn't doing it justice. I cut the images out with my ScanNcut, but the dies have been recently released...so be sure to pick them up before they are gone! After everything was dry, I went and added some detail with a white gel pen. Hey everyone! I just wanted to pop in and share a care I made a long time ago, and forgot to share on my blog. I've been really lazy, and only shared most of my cards on Instagram! So, make sure and follow me there. I made a simple card using the CTMH stamp set A Child is Born, one of my favorites from the new Holiday catalog! I colored the images with my Ziggies, and blended them with the Shimmer Brush...So pretty! I stamped the Nativity roof on some CTMH woodgrain paper, and then cut all the images out with my ScanNcut. I used some different CTMH B&T paper for the background, making it appear as a night sky...and keeping this a simple card. I popped the roof, the lamb, and Baby Jesus up on foam tape. That made it much easier to nestle the family together under the roof. I used the die from Woodland Wishes, as the banner, using some gold paper behind it. Hey everyone! Today I'm sharing a card I made using one of my very favorite stamp sets of this year. It is the Little Baby Jesus stamp set from Neat and Tangled. I couldn't wait to play with it, as I have several ideas...so here is the first. 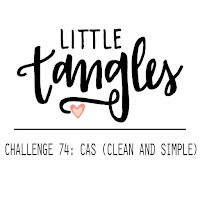 I made a CAS card, so I could play along for the first time with The Little Tangles Challenge. I used distress inks on Neenah Solar White CS and blended it very lightly for a night sky. I added a few splattered of distress inks mixed with perfect pearls, as well as plain water to make the background look more like a starry night sky. I colored all the images with Copic markers and added Wink of Stella, and then die cut all of the images. I love that the dies let you cut the baby out if you would like. So I nestled it a tiny bit below the manger hay. Then I heat embossed the sentiments with gold embossing powder. Then I placed the banner and popped up the Baby Jesus on foam tape. This was a very simple card to make, but I love how it turned out. I can't wait to use this stamp set again, I just love it so much! Hey everyone! Welcome the Tricks and Treats Blog Hop! If you came here from Katy's Blog, you are in the right place. This month we are featuring our Halloween projects, so there is a ton of fun in store for you! I knew I had to play with the cute little Monstrous Halloween stamp and die set from Close to my Heart. I'm never into anything scary...and I absolutely hate horror movies etc. So, this set is as scary as it gets for me. As cute as this set is for Halloween, it will also make a cute birthday card too. To make my card I stamped all the monsters with pigment inks. I used my MISTI, so I could go back over each one with a darker shade of pigment ink. So incredibly easy with the MISTI! So each monster and the sentiment have a bit of gradient color, which I love. Then after the monsters dried a bit, I slathered them with a shimmer brush. I die cut each of them out with the Thin Cut dies, and used my ScanNcut for the lollipop. I used the Sew Fancy die set from Mama Elephant to cut the circles out of my front panel, and popped it up with foam tape. I used a transparency sheet for my shaker card this time, instead of using Flip Flaps as I often do. I wanted more of the shaker noise this time...and it was fun to make since I have a craft room once again! I used some of the paper from the Jeepers Creepers Paper Pack as the back panel. To get the eyes to pop, I just inked up all the monsters in VersaFine Onyx Black pigment ink and punched them out. I totally forgot that I had the Jeepers Creepers assortment, which would have been way easier, lol...But, I like that the eyes I went to the trouble of making are different sizes. I added a bunch of Pretty Pink Posh sequins, then attached the back panel to the front. I love those tiny Iridescent Star Sequins so much, I had to put a few inside and on the front of my card. My kiddos thought this card was really fun! Thanks so much for joining me! You have made it to the end of the hop for this month! If you started here...be sure to visit Amie's blog to start the hop over, you won't want to miss what everyone has created! So onto my cards! I have two cards, and I will be sharing both with the Sunny Studio Blog Challenge. Now that I received my order from the new release, I was able to do what I love most...use a bunch of different stamp sets in a a new way! But first, I couldn't quite put the Autumn Splendor stamp set away yet. I really love it! This time, I stamped my images on Tim Hotlz watercolor paper so I would get all the texture...but still have a white background. (If anyone has found a high quality watercolor paper which is bright white, I would love to know the brand and where you got it~Help a crafty friend out!) I inked up the images with distress inks. Then I did some rock and roll inking to get some darker colored edges. I used a shimmer brush to blend the distress inks a bit and add some sparkle. After they were dry, I cut them all out and die cut them with the coordinating dies. Then I added the stems with gold pigment ink. I love how this stamp set has the solid berries, with outline stamps to match...I stamped both in gold, stamping the top layer twice to get a deeper color. I used my MISTI to make it super easy. Then I assembled the leaves and berries on the card, using foam tape for dimension on some of the leaves. I stamped the sentiment in Magenta pigment ink from Avery Elle. Then I added some sequins from Pretty Pink Posh and Neat & Tangled. For my second card...I was back to my usual style. I used a lot of different stamps, I will list them all below my card. I stamped out all of the cute animals and other images, and colored them with Copic markers. I used Wink of Stella to accent the images, and added detailing with gel markers also. I cut them all out with my ScanNcut, as I don't have any of the dies yet sadly. Then I went on to die cutting my card base. I used the oval dies from Lawn fawn to cut my top panel from Lawn Fawn paper, and the card base. Then I used the oval piece I had cut out of the card base for the inside. I blended a bit of pigment inks on the oval for some background color. Then I stamped the sentiment, making sure it would show when the card was open and closed. I attached all the animals popping them up on foam tape, so their tails could be placed behind them. Then I placed the baked goods in their arms. I placed all the images on the inside of the card, so they would peek out of the front how I liked it. It was a pretty simple card to make, and I just love foxes, so now I've fallen in love with these stamp sets as well! Hey everyone! I hope you are having an awesome weekend! We are getting settled in our new home...and I am so thankful I have a craft room on the main floor! I have been having so much fun playing with all my new stamps, and trying out new techniques. I have had some slider dies for a while, but as usual...I waited to use them, until I thought I could do it *perfect*! So, today I'm sharing my first slider card! I was dying to play with the super cute set from Lawn Fawn, Happy Howloween! I made a cute little scene card, that was so easy with the coordinating dies. I wanted to play along with the Lawnscaping Challenge, so I used Seedless Preserves, and Ripe Persimmon for my blending my background. The challenge was to use black, purple and one other color...so of course I chose orange. To make this card, first I made the background by blending distress inks on watercolor paper. Then I did my flicking water with Perfect Pearls trick, that I've been obsessed with since I discovered it last Halloween. I wanted to make a non-spooky sunset background. While the background was drying, I stamped my images and colored them with Copic markers. I used the coordinating dies to cut them out, but still fussy cut the costumes so they would not have a white border. I put the cute little pumpkin basket in the dogs mouth, so he could be the hero...offering a treat to make the ghost go away! Then I cut out the slider part on the background. I used a banner die as the slider cut to attach the ghost to, and I used the MFT slider replenishments to make it simple. Those things are totally worth it! I used distress inks to blend the banner cut and scrap paper to go behind the cut out portion of the card. Then I assembled all the pieces...It's really easier than I'm making it sound. Just try everything out before you add adhesive. Then I added the Leafy Tree Backdrop die cut frame, so I could pop it up with foam tape where it needed it and add the sentiment. Then I had a few oopsies from using a liquid adhesive...so I decided to add some sequins to the sky. For my next slider card I make, I won't use a liquid glue. It got a bit messy, so I had to hide a few oopsies. I also will use black craft foam like I used to for cards...but it's still packed away in my MIA crafty boxes. But, when you pull the banner up, the ghost rises out of the pumpkin! So fun, and my kids loved it! I hope you love it too! 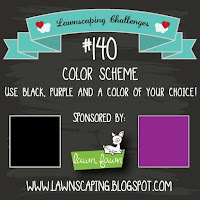 Join in on the fun at the Lawnscaping Challenge! Hey everyone! Just popping in to share my first card I made with a stamp set from Sunny Studio. I know...I'm late to the party! But, I've always been a fast learner, thankfully! Thanks to this gorgeous Autumn Splendor stamp set, I can say I'm hooked! As soon as I got this stamp set, the only thing I knew was I wanted to use distress inks and non-traditional fall colors. I had recently picked up some Rose Gold sequins from the Pretty Pink Posh shop. So, I thought I would try to make colors work with pink for my fall card. I had so much fun playing...I'm really like a kid in a candy store when I get new stamps. To make this card, I started out stamping the leaves with Tim Holtz Distress inks on Bristol Smooth paper. Other than my colors, I really didn't have a plan. Then I went over the stamp with my CTMH Shimmer Brush. (Yes, the one I said I really didn't recommend, and now I'm using on every card, lol) It actually works amazing with any project you would use water on. Just don't get it near Memento inks, or inks that don't play well with water. But, it was perfect for how I was playing today. You could do they same thing with any waterbrush, you just wouldn't have all the sparkle I crave. But, it turned out this took most of the splotches out of the stamped images! I've always wondered if I could use distress inks to stamp with, without a big mess. I will definitely be using this technique again! Then I took the darker shade and just inked half of the image with the distress ink cube, and stamped again. This lovely stamp set comes with images of half the leave...which is what inspired me. It just looked better to me for some reason, to have the light color on the left. Probably just because I'm right handed?!? Then I stamped the stems, berries and acorn with gold pigment ink. Then I cut them all out with the coordinating dies. I stamped the sentiment and just randomly attached the leaves around it, popping a few leaves up with foam tape. Then I added some sequins for some more sparkle. It was actually very fast and simple, so I encourage you guys to try it out! The only thing I would do differently next time, is I would die cut the images first...and then stamp them. A few of my stems didn't line up the way I had stamped them. Today I also found out Sunny Studio has a wonderful blog full of inspiration. Hey everyone! I wanted to share my recent Tooth Fairy card I made using a few stamp sets from Lawn Fawn. This card was super easy to make, once I finally was able to get my hands on the Plan On It stamp set. I've had this idea since the stamp set came out, lol! 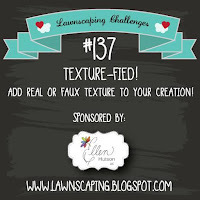 I am also entering this card in the Lawnscaping Challenge for using texture. I love these little fairies, and once you paint their wings with Stickles...that chunky glitter gives a lot of texture without making a bulky card. Hey everyone! Just popping in to share a few cards I made with some of my new stamps I picked up from The Greeting Farm. Both cards were pretty simple, as I just used one stamp set on each. Yes, you read that correctly, lol! We are getting ready to move, again...so I am trying to keep it simple! For my first card I used Ho Ho Holidays, and a few dies from Mama Elephant. For my next card, I used the TGF stamp set Little Fairies. I masked them off, and tried to ink blend on Neenah Solar white CS. It didn't blend that well...I will stick with blending on watercolor paper from now on, lol! Hey everyone! Thanks for stopping by my blog! Today I have a card to share from CTMH. I have splurged on a lot of new product recently...I am always a sucker for new Halloween and Christmas stamps from all companies! Today's card is a one stamp wonder for me, as I usually love to combine a few different stamps. I had so much fun playing...here is a sneak peek of my mess/fun! For my card I started by stamping it with black pigment ink, and embossing it with clear embossing powder. The I blended Pansy ink with a light touch. I splattered some water to remove a bit of the color. Then I took the Pansy ink, and Emerald re-inker mixed with Perfect Pearls and splattered them randomly. I love how this turned out, but I loved it so much...I now need all the re-inkers, lol! I cut tiny rectangles out of the sentiments and then used a circle die from Mama Elephant to recess the spider. I popped the card panel up with foam tape, so it would set higher than the spider. Hey everyone! Welcome to the Blog Hops with Heart Summer's End Blog Hop! If you came from Amie Kiger's Blog, you are in the right place. I hope you had a great summer! My summer has been the most interesting...of my life, lol! My family and I have almost moved to Arizona, and South Carolina...and while we are still in California, my husband could get news of a new region to take over any day. We have been so incredibly lucky to visit so many majestic beaches and National Parks all over California and a tiny bit in Oregon. But, living in limbo has it's ups and downs for sure. So, I'm choosing to focus on the wonderful memories we are making with our children! If we have to live in limbo...living two hours from the pacific ocean or two hours from Lake Tahoe, has been the way to do it! For this months hop, we are featuring anything about summer. I hope you great some great inspiration! For my card, I combined the super cute stamp set Fiesta Gathering with the True Love stamp set. Fiesta Gatherings is one of the great sets available only for consultants. I colored the images with Copics, and then added Stickles to the Pinata and candy. I used the Hit the Road stamp set for the #we'removing sentiment. Think this will be good to send my mom, to tell her we are moving...again??? Of course I had to hang the pinata so it could swing! Next on the hop, is Wendy Coffman! Thanks so much for joining me!